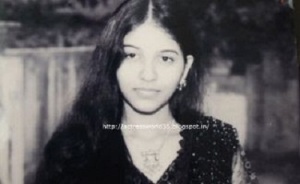 Actress Anjali was born on 11th September 1986 in Razole, Andhra Pradesh State. She attended schools at Razole and Chennai. She holds a Bachelors degree in Mathematics. She started her career with short films and later got several offers from film producers. Her parents encouraged her film career from the very beginning and supported her always. She even tried modeling for sometime before getting big break in cinema. Her film debut was with Telugu movie Photo in 2006 but the film failed at box office. Her first blockbuster hit was Tamil film Kattradhu Thamizh in 2007 co-starring Jiiva and Karunas, she earned Filmfare Best actress Debut Award for her performance in the film. Anjali subsequently appeared in numerous commercial successful films like Angadi Theru co-starring Mahesh and A. Venkatesh, Thoonga Nagaram opposite Vimal, Mankatha co-starring Ajith Kumar, Trisha Krishnan, Arjun Sarja, Lakshmi Rai and Andrea Jeremiah, Engaeyum Eppothum co-starring Jai, Sharvanand and Ananya, Kalakalappu co-starring Vimal, Shiva, Oviya and Santhanam, Seethamma Vakitlo Sirimalle Chettu co-starring Venkatesh, Mahesh Babu, Samantha and Prakash Raj, Settai co-starring Arya, Santhanam and Hansika Motwani, Balupu co-starring Ravi Teja and Shruti Haasan, Masala co-starring Daggubati Venkatesh and Ram Pothineni »”>Ram Pothineni, among other films. Her mother name is Parvathi Devi. Anjali considers Bharathi Devi as her step mother. Anjali has two brothers named Ravi Shankar and Bapuji.